If you want to understand how to balance form, texture and colour to absolute perfection, study the work of Irish designer maker John Lee. The difference between good furniture and truly exquisite furniture is the way that these three factors work together. 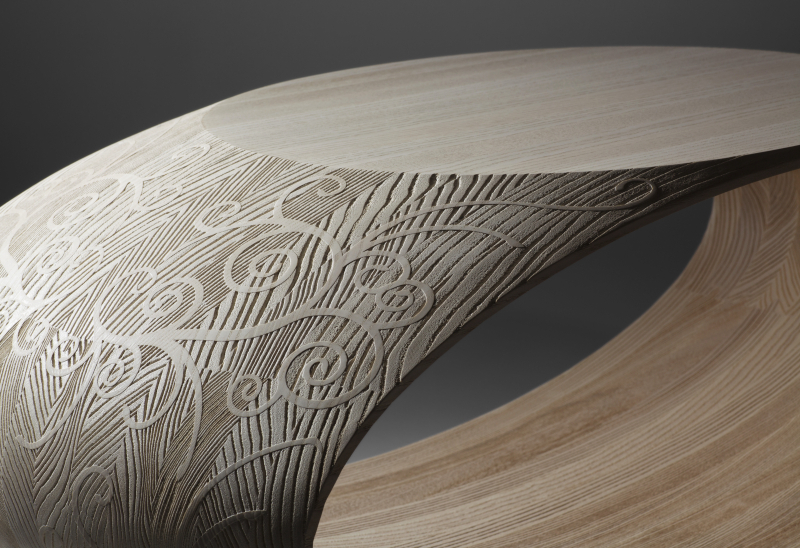 In the example above, the oval form of the table and the highly detailed carved texture on the outer surfaces are very strong. To balance the strength of these two elements, he has bleached the colour out of the timber and incorporated crisply finished plain surfaces as a foil for the intricate carved work. The result is a perfectly mixed cocktail for the eyes. 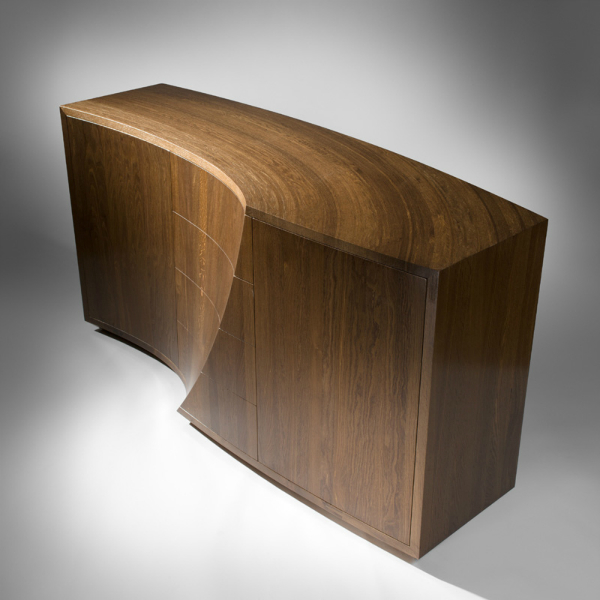 Form is used again in John's wave sideboard, but this time the figure of the oak, enriched by fuming, provides all the surface interest you could ever need. The sweeping curve in the grain of the top panel leads the design, careful selection and orientation of the timber for the doors and sides harmonise with it, and the flare through the drawer fronts brings the whole design to life. The surfaces are all smooth though, no texture, no drawer pulls, just form and the natural figure of the timber. Choosing two of the three elements to accentuate and then downplaying the third will make your furniture more aesthetically appealing. Scale and proportion are also important considerations, but these can be achieved mathematically. Following the work of one or two really good designers and seeing how they carefully balance the different elements to maximise the visual return from both materials and making time is the best way to develop an understanding of how good design works. Designing exceptional furniture and good furniture is the great and good blog shown.Thanks! Some stunning pieces. Thanks for the link, Matthew.